Who: We are looking for excited and enthusiastic volunteers to greet new students and parents, give directions to area parking lots, direct traffic, and answer questions from new residents and their families. Why: Each year the University of Georgia welcomes more than 7,000 new students into the many residence halls in a very condensed period. 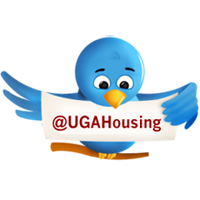 Hunker Down with Housing is an awesome opportunity to help new and returning students as they move into the residence halls, all while showing off your UGA spirit! Hunker Down with Housing volunteers work diligently to ensure the initial days of move-in will run smoothly and serve our target audience: first-year students. Since the first Hunker Down with Housing in 1998, volunteers have successfully moved in more than 71,000 students and helped them begin to call UGA home. 2013 will be no exception! If you are a student interested in volunteering for Hunker Down with Housing 2013, please fill out the #HDWH13 team application. Check out this highlight video from Hunker Down with Housing 2011! Follow the conversation on Twitter using the hashtag #HDWH13! Meet the 2012-2013 RHA Exec Board!